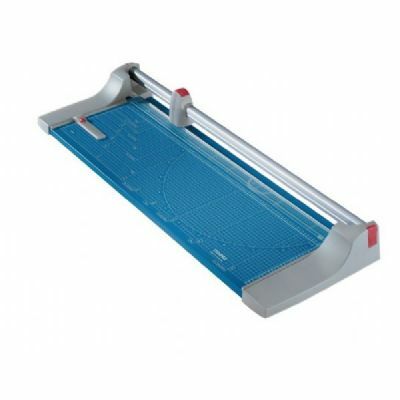 Dahle® 18" Rotary Trimmer.Quickly and easily cuts paper, photographs, and films accurately and precisely. Features include a ground rotary blade which is totally enclosed in plastic housing to ensure safety, aluminum guide bar, clear plastic clamp strip, and twin side rules. Metal baseboard is gridded with a variety of standard cutting sizes, as well as a protractor for angled cuts. 18"cutting length. 5 sheet capacity.